Most of us are aware of the challenges that go along with the breakdown of the family when partners divorce. Once a couple decides to divorce, many issues and questions arise that had never been previously contemplated by the couple, such as who gets custody of the children, how to divide the marital property, finances, etc. The process of divorcing one’s spouse can be extremely difficult in and of itself. However, when you combine the process of divorce with custody and other parenting issues, the process can become much more challenging. For many dueling spouses, the process of separating themselves from their marital partners and maintaining a parental relationship with their children can be a tricky balancing act. Once the divorce is finalized and each parent is living in separate environments, one parent might still be consumed with anger, hurt or resentment, making it difficult to move past the divorce. Some parents find it tough to separate negative feelings about a former spouse without including their children, forcing them to choose sides between their parents. Unfortunately, once parents engage in a battle to pollute their children’s feelings about the other parent, toxic co-parenting usually follows. As parents we all wonder how children will respond to a divorce once we have made the decision to end a marriage. We often wonder if our children will hate us, blame us for the divorce, or will have a difficult time adjusting to a one-parent household. Our main priority as parents, divorced or not, is to ensure that our kids have a happy, healthy, stable and balanced life. But for many divorcing or divorced parents, emotions run high and conflict with our former spouse feels unavoidable. For some couples it is not easy to separate when you share a child with someone and both parties desire and intend to remain an active part of the child’s life. While the process of a divorce usually signals an end to the intimate relationship between the parents, there is still a co-parenting relationship that needs to continue when there are children involved. Parents need to develop a healthy relationship post-divorce for the sake and well-being of their children. It is essential for the child’s emotional and psychological health that each parent behaves respectfully toward each other and does not try to interfere with or undermine the child’s relationship with the other parent. Do not speak negatively of the other parent to the child or speak in an unflattering way about the other parent when the child is around. Although some divorces can be contentious with understandably hurt feelings and anger, children should be protected at all times from emotional pain. Both parents are required to provide a safe, secure, and healthy emotional support network. Creating a healthy partnership with the other parent reduces the likelihood of making a child feel he or she needs to pick a side between the parents. Children should be reassured that although parents no longer love each other romantically they still have some degree of love and respect for the other parent because they share children. Recognize that your child needs to have ongoing access and communication with both parents. Don’t avoid communicating with the other parent about any issues pertaining to the children. Each parent should have an honest and loving relationship with their children, so be sure what you saying to your children about respecting the other parent matches how you speak and behave toward the other parent. Parents are encouraged to consider the other parent’s point of view whenever parental decisions need to be made. Remember both parents love the children equally, so it is only fair that you listen without judgement to any of their parenting suggestions and concerns. After all, if you’re initiating the concern, consider what the other co-parent might be thinking or reacting to what you are saying. By identifying what triggers negative behaviors, former spouses can begin the process of healing from the divorce and becoming more effective parents. By knowing what upset you about a former spouse, you can develop options to manage your responses to the triggers. It is only natural for children to question their parents about the reasons leading to their divorce; however, the explanation should not include blaming the other parent, cheating, the other parent no longer wanting to be a family, etc. Simple explanations such as “we decided we did not want to remain married, but we are still a family”, answers the child’s question without assigning blame. Be encouraging and avoid interfering. 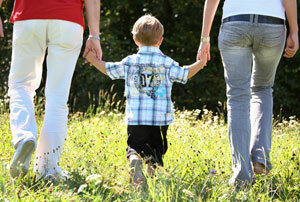 Divorce is not only confusing for spouses but for children as well. Children need to know that even if their parents are no longer together, the parents love towards the children remains and has not been changed or affected by the divorce. I believe this article is premised on the assumption that divorced spouses must engage in a duel. This article encourages parents to gaslight their children. There should be a disclaimer that this article is not intended for those who are abuse survivors. Being honest with your children about why the divorce happened is sometimes necessary to prevent the infliction of further harm. This article does not give solid advice on how to cope with an ex who was an abuser. Completely disagree. Honesty is more important especially when it means defending your self from toxic ex attempts to lie to your child and poison them against you. The article says to not give a detailed explanation…it says nothing about being dishonest. As an abuse survivor I did not deem it appropriate to say “Mommy and Daddy aren’t together because Daddy tried to kill Mommy” that is incredibly damaging to a child. Speaking your full and detailed truth is best left for a close friend or therapist…who can help you work through your feelings and how to set boundaries and ensure safety both physically and mentally from a toxic abusive ex. This article doesn’t help actually how to communicate with a toxic ex with bi-bolar or histrionic disorder.